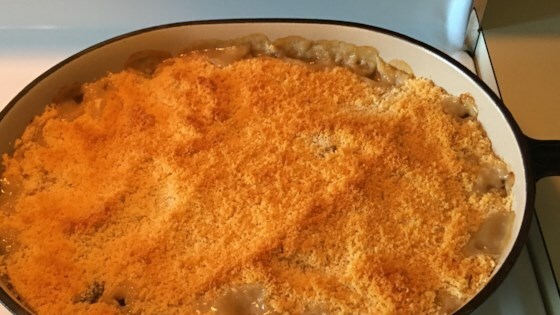 "Great way to use up leftover turkey, really different casserole good enough for company. Fast and easy." Bring 2 1/4 cups water, rice mix plus seasoning pack, and 1 tablespoon butter to a boil in a covered saucepan. Reduce heat to medium-low and simmer until rice is tender and water is absorbed, about 25 minutes. Stir turkey, cream of chicken soup, celery, 1 cup water, water chestnuts, onion, and soy sauce into wild rice until well mixed. Transfer turkey mixture to a 3-quart baking dish. Pour 2 tablespoons melted butter over crumbs in a bowl, stirring to coat crumbs with butter. Sprinkle buttered bread crumbs over turkey mixture. Bake in the preheated oven until bubbly and golden brown, about 30 minutes. I made this recipe last week and it was wonderful. I substituted cream of mushrooom soup for the cream of chicken. everyone who had it cleaned their plates! This casserole is a litle bland. Next time I will add more spices. I used cubed bread instead of crumbs and added a teaspoon of chicken bullion to the water. Family loved it!!!! I used scallions instead of white onion. It was fantastic and I will definitely make it again.